Basic Concepts is making its spill containment products available to agriculture. With increased environmental concerns for chemical and fuel spills on farms, Basic Concepts, Corp., says its temporary and portable plastic berms could be problem solvers. The company's line of secondary containment berms, drip berms and specialty containment solutions have been proven in military use around the world and offer farmers a dependable way to contain chemicals at wash and filling sites, and even ways to contain grain stored on the ground. 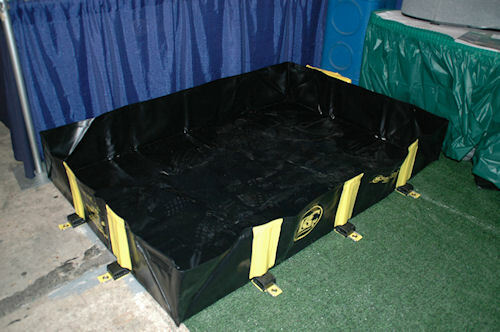 Spill containment is a sure thing with a tough a portable spill berm from Basic Concepts, Inc. Popular with the military, the portable Quick Berm can be used for everything from fuel and oil to chemicals, and are now available for agriculture. Sizes for various temporary berms range from 4' X 6' to 14' X 54', although Basic Concepts can custom make various models of their products to fit nearly any need. Additional product lines include "shop" size berms for catching leaks and spills beneath equipment, or "on-ground" liquid storage – sporting walls up to 3' tall with a footprint up to 100' X 100'. Other features include "drive over" ability and quick installation without heavy equipment. For more information on Basic Concepts products and how they might fit on your farm, visit www.basicconcepts.com, or call (800) 285-4203.